UDM Downloads > Excel Contacts to Outlook PST! SysTools Excel to PST conversion software successfully and without difficulty export complete Microsoft Excel data to Outlook with 100% result. Excel Contacts to Outlook PST tool creates distribution list of Excel contacts and after that you can convert distribution list to Outlook. Excel Contacts to Outlook PST software package does not demand any special skills to carry its function. Excel to Outlook converter tool allows converting CSV file into PST files and easily mange duplicates contacts of Excel file. Excel to Outlook utility is windows based software and displays well with Windows 98, ME, NT, 2000, XP, 2002, 2003, Vista, Win7. 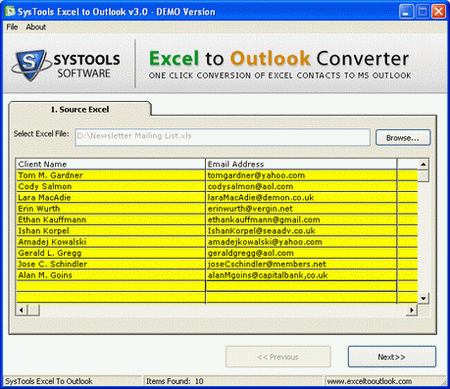 Trial version of Excel into Outlook contacts converter tool is present at our websites for free of cost. Trial version 3.0 of XLS to PST software allows user to export only 10 Excel contacts to Outlook. If you are interested to convert Excel contact to Outlook, you must purchase full licensed version just $69 (Personal License), $199 (Business License) and $299 (Site License). SysTools software providers you bundle offers for both the software ("Excel to Outlook" & "Excel to vCard") on 40% OFF. Further inquiry about Excel to Outlook software you can contact our technical supports team 24X7.